Martha’s Vineyard, or “The Vineyard” as locals call it, is a beautiful island to the south of Cape Cod in Massachusetts. With 125 miles of seashore and varied landscapes, the island is a year-round vacation destination. South Beach is a pristine location pounded by the Atlantic waves. It has a protected salt pond dedicated to preserve its timeless beauty. It once housed World War II barracks as evident from military artillery found in the area. The Edgartown Lighthouse, a short walk from Edgartown Harbor, offers some insight into the history of the island’s coastal life. Visitors can explore the interior and also access the lantern room. Flying Horses Carousel is an 1876 platform carousel that provides an enthralling experience for children. Designated as a national landmark, it is the nation’s oldest operating carousel and represents the origin of tourism in Martha’s Vineyard. Gingerbread Cottages in Oak Bluffs make up the “Campgrounds” comprising about 180 small cottages evoking fairy tale lands. Built in the 1800s, these brightly colored cottages are preserved by private owners. The Aquinnah Cultural Center preserves and interprets the Aquinnah Wampanoag history, culture and indigenous past. Visitors can experience 10,000 years of legends on Noepe. Mytoi Garden, a Japanese-style garden, is in the pine forest of Chappaquiddick. It is a perfect walking tour destination. Polly Hill Arboretum, spanning an area of over 20 acres, is home to about 1,700 plant species including the popular North Tisbury Azalea. Martha’s Vineyard Museum has exhibits of cultural artifacts, archival records, genealogical records and historic photographs. It aims to preserve and increase awareness of the island’s history. Menemsha Beach is known for its sunset views. 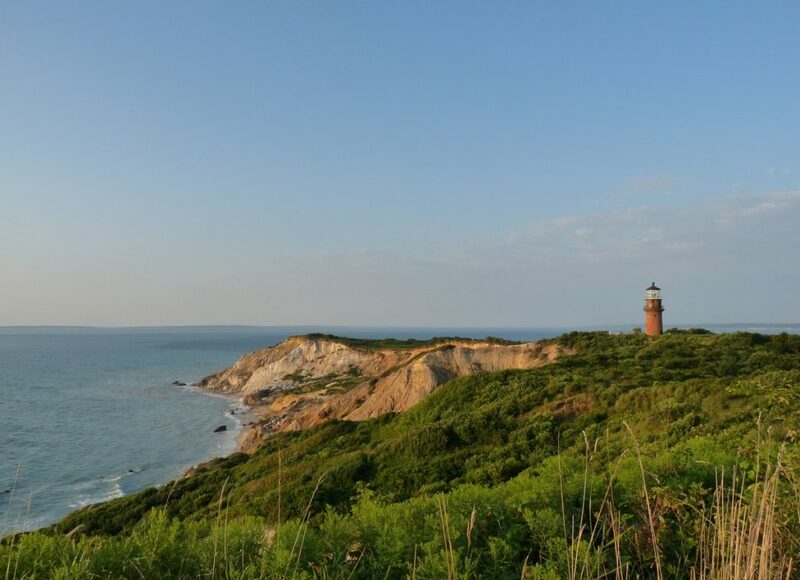 The Menemsha Hills provide stunning views of the Martha’s Vineyard landscape amid docks bustling with fishing boats and inviting seafood eateries. Island Alpaca is one of the best recreation spots for children. It gives a glimpse into the benefits of llamas to the farming industry. Gay Head Cliffs in Aquinnah are brightly-colored clay cliffs amid spectacular views and glimpses of rich Wampanoag history. They are part of a protected historical site. Martha’s Vineyard is about 85 miles from two major airports – Logan International Airport in Massachusetts and T.F. Green International Airport in Rhode Island. Ferry services are readily available from New Bedford, Woods Hole, Falmouth, Nantucket and Hyannis in Massachusetts and from Quonset in Rhode Island. Private charter airlines service the island. Marina and mooring services are available at Vineyard Haven, Edgartown, Oak Bluffs and Menemsha. To get around the island, visitors can opt for shuttle buses, taxis, car rentals or bicycles. Accommodations include motels, hotels, inns and resorts. Located at South Beach in Edgartown, the Winnetu Oceanside Resort has private cottages, the main hotel with 1-4 bedroom suites and 2-5 bedroom vacation home rentals. The Lure Grill is an ocean-view restaurant offering fine cuisine inspired by local and seasonal ingredients. Amenities include heated swimming pools, fitness area, yoga classes, shuttle transportation, concierge services, parent-toddler programs and more.